What is the best way to safeguard and backup your Blu-ray movie discs? Making a digital copy on your hard disk may work. 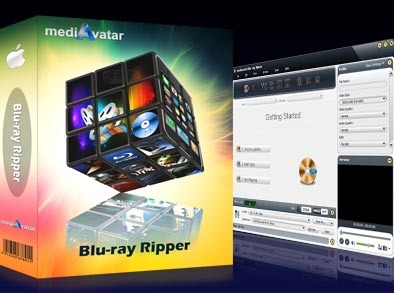 mediAvatar Blu-ray Ripper for Mac is just based on such a purpose, which helps Mac users rip Blu-ray/3D Blu-ray disc movies to HD (High-Definition) video formats (H.264/MPEG-4 AVC, Apple TV h.264 720P, HD WMV, MPEG-2/MPEG-4 TS HD), or rip Blu-ray/3D Blu-ray M2TS movies to MKV, AVI, MPEG, WMV, DivX, MP4, H.264/AVC, RM, MOV, XviD, 3GP, FLV and other common video formats.Besides this, Conversion from Blu-ray disc to 3D videos and from 3D Blu-ray to other formats of 3D videos can also be supported. Not only backing up your Blu-ray discs on your Mac, you can also play Blu-ray disc movies on iPad, iPod, iPhone, Apple TV, PSP, Xbox, Zune, NDS, Wii, mobile phones and many other media devices. Backup Blu-ray movies to your Mac and watch them on the go with media devices just by using this mediAvatar Blu-ray Ripper for Mac! Rip and convert Blu-ray movie discs to either HD videos (H.264/MPEG-4 AVC, Apple TV h.264 720P, HD WMV, MPEG-2/MPEG-4 TS HD, etc.) or general video formats (MKV, AVI, MPEG, WMV, DivX, MP4, H.264/AVC, RM, MOV, XviD, 3GP, FLV, etc.) on Mac. Back up your Blu-ray discs to your hard disk to protect them from scratching again and again. Extract and rip soundtracks from Blu-ray movies to various audio formats: MP3, WMA, AAC, WAV, OGG, FLAC, APE, M4A, RA, AC3, MP2, AIFF, AMR, SUN AU. Mac users rip Blu-ray discs not only for backing up, but for playing them on iPad, iPod, iPhone, Apple TV, PSP, PS3, Zune, mobile phones, Windows mobile devices, PMPs and many other multimedia devices on the market. Rip 3D Blu-ray video to standard 2D video; Convert 3D Blu-ray video to other formats of 3D Video; Convert standard 2D Blu-ray video to 3D video. Want to get unwanted movie clips cut off? Clip any segments from Blu-ray disc movie and merge them into a new title to output. Merging several titles or chapters into a single file or splitting a file into several parts depends on their file sizes or your own special requirements. Crop movie frame to remove the unwanted borders; adjust the frame brightness, contrast and saturation; change your Blu-ray movie effect by adding artistic effects (gray, negative, old film, etc.). Change or adjust subtitles in your Blu-ray movies; add image or text watermarks to the outputted Blu-ray movies. Not only preview original or clipped movies, but also check after-effect movies, even compare the original and after-effect movies at the same time before ripping. Although this Blu-ray ripper Mac optimized all the profiles to make them to be used directly without any further settings, you can still change the parameters (resolution, bit rate, frame rate, sample rate, resolution, codec, and quality, etc.) to satisfy more professional requirements. Ever feel it difficult to change video bit rate to get the exact output file size you want? Now using the Bitrate Calculator tool to compute video bit rate, customizing output file size has never been easier! Simultaneously rip a batch of M2TS movies into video files at the highest speed possible according to your configuration. Adopts NVIDIA CUDA and AMD APP GPU acceleration technology, promoting the Blu-ray ripping speed by at least 2 times. And also supports multi-threading decoding technology to make full use of the multi-core CPU, which also greatly speed up the ripping speed.